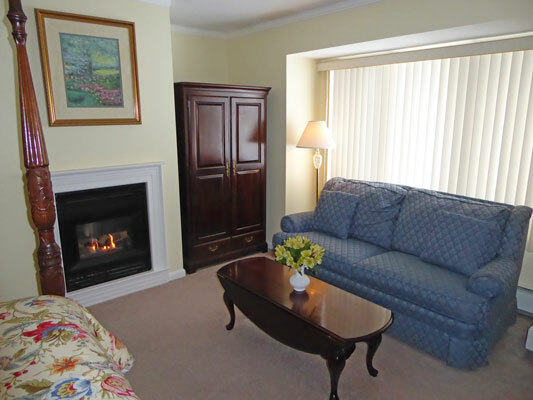 French Provincial furnishings are used in Room 10 at the Birch Ridge Inn. 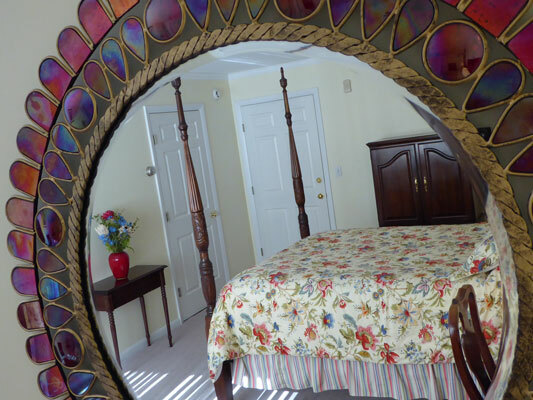 A queen sized cherry four poster bed greets you when you enter the room. A matching bachelor chest and a writing desk with side chair accent the bed. Crystal lamps are used to complete the decor. Complementing the bed, a Cherry armoire is used as Room 10's closet. It sits in an alcove beside the fireplace. Over the fireplace you will find a floral print in a gold frame. Room 10 also features a very large bathroom that is equipped with a rectangular 6 foot whirlpool tub for 2 . The tub also has an integral shower. Crystal lamps are used in the bathroom. The whirlpool tub is wonderful. With a little champagne, a hot, bubbling whirlpool is a great way to get reacquainted with your partner. Beside the bed, you will find a large window box with a three bay window. The window looks out to the back of the inn, into a private area surrounded by deep woods. In the summer, a green canopy provides solitude, only to come alive with color in the fall. During winter, the beauty of snow falling into the forest is very tranquil and peaceful. In the window box, you will find a very comfortable, over stuffed, couch with a matching cherry coffee table. They form the perfect combination for a quiet afternoon with a good book, or late night relaxation in front of the fire with a beverage. For the summer months, the French Provincial room is air conditioned. Of course, the room is also equipped with a HD television, a large art deco mirror, an alarm clock with usb charging port, and complimentary WiFi internet access. As is the case in most of the rooms at Birch Ridge, the television is completely hidden from view when you enter the room. Your entire visit could be spent without even knowing that it is there. 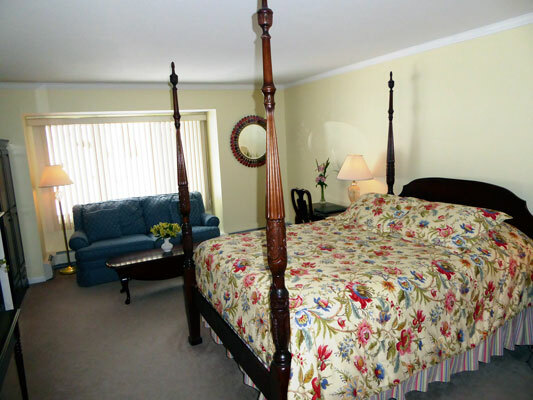 Use our Room Rate Calculator to price out a stay in the French Provincial Room.